Last week whilst in work a colleague of mine commented on the hat (FDNY) i was wearing. She said to me whilst pointing at the hat that she was off to their (NYC) next week. I replied "oh you off to see your brother?" (who i knew lived stateside) and she said "no he died last year"
After completing boot camp, Scott joined the crew of the USS La Salle, the flagship of the 7th fleet. Stationed in Gaeta, Italy, he met Analisa, a local girl, who became his wife and mother of his son Conor. While in the Navy he was stationed at many places from the lovely coast of Italy, to the war torn country of Iraq, to the lovely pacific island of Guam. While on his last deployment to Memphis in Tennessee, Scott fell ill with his stomach. On Christmas Eve 2015, he was diagnosed to be in stage 4 cancer, that he would never recover from. 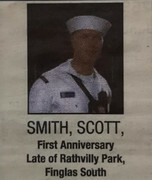 Scott remained in the Navy until he passed away on the 2nd February 2018, aged 39. After a military funeral with honors, Scotts wishes were fulfilled and his ashes were laid to rest by the Peach tree he planted in the front garden of his home in Jacksonville, Florida. After 15 years in the Navy he was intered with the Rank of Chief Petty Officer (Not to shabby for a boy from Finglas South). Scott loved Liverpool Football Club and always added Y.N.W.A (You'll Never Walk Alone - Liverpool FC Motto) to his signature which he sang with gusto over a pint on game day. Scott never forgot his roots and was known throughout his service as "Irish". He is sorely missed by his wife and son, his mother Maureen, father Patrick, sisters Maria, Anna, Caroline, Shannon and twin brothers Daniel and Matthew, their spouses, cousins and friends. We all miss your unique personality and sense of humour. All our love son, Dad"
My Condolences to you, Dec, and the family members of Scott Smith. Taken away at such a young age. Condolences, Dec, to you and Chief Smith's family and friends. Please remind me in early October 2019 and I shall remember him at my Chelsea Veterans Day Ceremony. CONTINUED REST IN PEACE TO CPO SMITH.